Wait, maybe this is "normal practice", having evolved from four wheel tenders independent of car trucks. Maybe this was considered the norm, and the use of trucks with standard center plates and side bearings was considered new and revolutionary, thus the tender trucks in question had no better name than, tender trucks. Well it may not have had a generic name, but I would say that it is a concept departure from normal practice that is greater than any of the many variations within all four-wheel trucks, including all types of side frames and also including the once popular swing motion category. You miss my point. 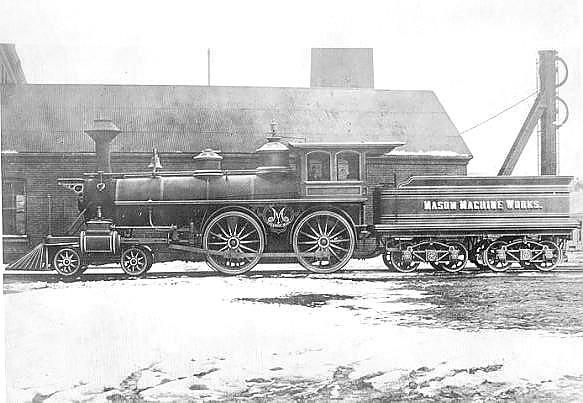 Did other Civil War era locomotives use other types of trucks, or did tenders evolve directly from four wheel pedestal type arrangement where the springs transferred the weight directly from the frame to the journals to this eight wheel 'semi-pedestal' arrangement where the weight was transferred directly from the frame to two axles, and through the equalizer to the other two? Meaning that the adoption of what later became the standard truck that swiveled under a centerplate came second, not first? Remember, these tenders were so short compared to the engine wheelbase that the trucks really didn't need much swing. If you view the tender as a car, then it seems to need trucks. If you view it as an adjutant to the engine frame, maybe it doesn't. It was my opinion that some form of three-piece truck (understood as two sideframes with primary springing between them and a bolster) were common on tenders for almost the history of locomotives. There are some very specific 'covert' improvements in making the truck frame rigid (bearing performance/longevity, reduced unsprung mass at high frame strength against derailment, etc.) but this is the feature that imho 'necessitates' the long "equalizing" springs bearing on the journal tops. The better frame support from 'outside bearing' is probably more a fringe benefit at best, if I am to believe some of what I'm seeing in the actual 'as-built' design of the CP trucks. Both of J3A's new pics look like the later and more standard 4-point suspensions (all weight on side springs) that use the same truck fore and aft like the Gov. Stanford. I think you make a good point about the short truck spacing of the early tenders. I have some thoughts about that and some other points as follows. Also, to your question about whether these trucks were a step between four wheel tenders and tenders on two pivoting trucks, I looked through George Abdill’s book, Civil War Railroads, and find lots of photos of tenders with four wheel trucks. But only two photos show tenders with this class of tender trucks with the big elliptical springs providing direct side bearing suspension. One was a 4-6-0 named E.M. Stanton owned by the U.S. Military Railroad. 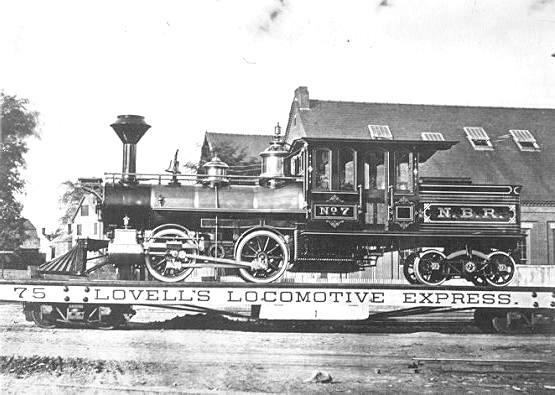 The locomotive looks nearly new and was photographed 7/1864. The other was named W.G Hewes built 5/1865. So, my general assumption is that the trucks we are discussing originated in the mid to late 1860s, and were used up to about 1900. I have some more thoughts as follows. In general, these trucks seem to pose questions about their ability to negotiate curves. Curves are no problem when you have the primary load transfer through a thrust center bearing as was the more typical practice. But the price paid for that convenience is stability when the load rides on one central point of the truck. So it seems to me that this deficiency was the inspiration behind the development of this alternative design which transferred the load out directly to the four wheels of the truck. The purpose was to optimize stability. But then these trucks create new problems that are not associated with the conventional center bearing trucks. Apparently, in connection with this pursuit of superior ride stability, another departure in the form of the three-point suspension scheme was developed. I believe that one indicator of this concept shows in photos where one of the tender trucks has the elliptical leaf springs, and the other does not. I would estimate that in all photos of tenders with this general class of tender trucks with the leaf springs, about 5% show the leaf springs in only one of the trucks on the tender. However, it is apparent that a three point suspension system does not require a truck without the leaf springs, as we see in the example of the IID #151 tender (in the other thread on those trucks). In the case of the general class of these side bearing leaf spring trucks, the problem posed by curves is that the leaf springs have to move in an arc traveling generally fore and aft in relation to the tender bottom frame. And during this movement, the springs have to carry the load of the tender. In this load transfer, there are two options to address this movement. One is to have the spring move with the truck and slide in relation to the tender bottom. The other option is to have the spring fixed to the tender bottom and have the truck move relative to the fixed spring. Even if the first option is chosen, the spring must still be able to move relative to the truck where its ends stand atop the journal boxes. This is because those ends must be able to spread apart as the spring is compressed. So if the plan is to have the spring move relative to the tender bottom when entering and exiting curves, it still must also be free to move relative to the journal boxes. Therefore, in that case, the spring is not solidly attached to anything. It is just loosely captured. It seems to me that transferring the weight of the tender though these sliding connections between the tender frame and/or journal boxes and the spring would cause a lot of friction which would run the risk of causing a derailment by inhibiting the truck from pivoting for curves. I suspect it was normal practice for the engineer to squirt oil into the cast iron “tubs” on top of the journal boxes where the spring ends sit. However, such lubricating would not be practical for the sliding connection between the top of the spring and the bottom of the tender frame. Initially, I wondered if the ends of the springs sliding in the tubs on top of the journal boxes would provide enough movement to accommodate the pivot of the truck. If so, it may be that some of this class of trucks had the spring mounted solid to the tender frame. At first consideration, it would seem that the tubs would not allow enough movement for the truck pivot. However, when you have such a short distance between truck centers as is the case with these early tenders, perhaps the truck pivot would be small enough that the movement of the spring ends on the tubs might be accommodated. If so, this would simplify lubrication by being able to drop oil on the tops of horizontal surfaces. If it were routine to oil these, I would expect to see some degree of raised flange on all four sides of the spring tubs to help contain the oil. I think the short wheelbase of these tenders answers a large portion of the problems with these trucks. Here's a scale frame/truck view of IID151 based on the measurements from Mr. Morris on the other thread along with some guestimation. The trucks are shown rotated just 2 degrees. I have yet to drag out the book and run the actual numbers, but dropping an arc under them the tender looks to be able to handle about a 24 degree curve - very functional even for track standards of the time. I will be posting the rest of the new IID151 scale drawings on the other thread shortly. I also am curious about the side bearing issue on the outside bearing (rear) truck and took a stab at it on the other drawings based on the CP229 drawing. Depending on the actual design, I think the very limited motion of these trucks would be served by a pivoting wedge design, but it would seem to be a very high maintenance item prone to failure. The biggest problem I see with the wedge as shown on the CP229 drawing (and my current guess) is the relatively small size of the fulcrum pin that seems apparent (and even smaller than 229's) in the IID151 rear truck/side frame pic on the other thread. Both seem very small for an iron or relatively primitive steel pin in sheer under a tender with the working weights listed of 54000 lbs for 151 and 63000 lbs for 229. Minus the weight of trucks, there would still be about 13000 lbs. dead weight on each pin for 229. Not unworkable, but still likely a headache as dynamics would increase loads greatly and frequently. I doubt there was much longitudinal movement of the spring ends in the side frame spring bearings beyond what's associated with spring compression - the very fixed bearings are enclosed on 5 sides to restrict motion. The longitudinal motion of the rear truck springs relative to the tender frame would be almost entirely at the top/fulcrum wedge. This very limited motion of the various components seems to be supported by the pic of Woodstock 3, which appears to have the spring groups loaded from the tender side sills by swing links from the sills to the bottom of the spring clamps. Both the 1875 and 1883 Forney Catechisms as well as the 1900 Grimshaw Catechism exclusively state that tenders use three-point suspensions (they don't give much detail). There is no mention of any other design and the catechisms didn't focus much on tender design, leading me to believe the three-point was considered the 'standard' of the era, or at least was highly prevalent even though it seems the MCB swing motion arch bar trucks were regular practice well before the turn of the century. 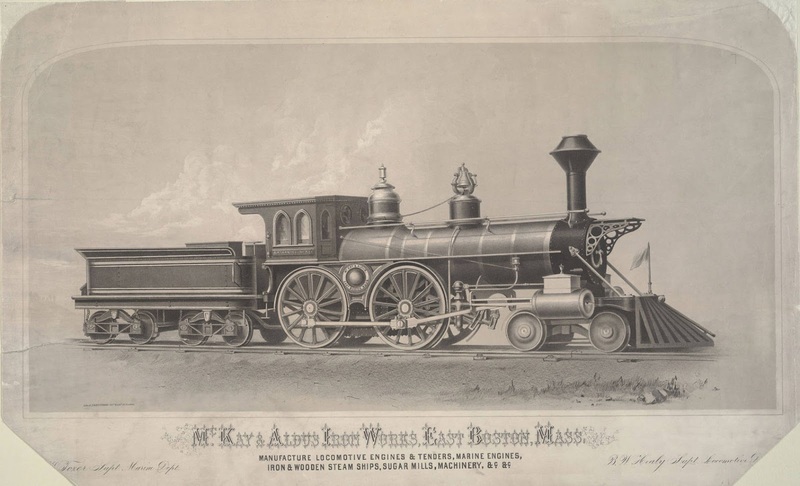 As to other tender truck designs, take a magnifying glass to Abdill's Civil War Railroads, White's American Locomotives and old catalogues like the 1899 Brooks Works and you'll get a huge taste of what was really out there, without wasting time on periodicals that carried engravings and boastful inventor's claims. The 1899 Brooks catalog shows just about every type of tender truck available then, from a rigid frame three axle non-equalized 1840s pedestal design for the Imperial Japanese Railway to standard MCB archbars to 1860 steel-frame equalized to FOX Pressed Steel. The one type of tender truck that doesn't appear in the 1899 Brooks is the top-elliptical like the CP designs. There were three axle tenders with equalized 1+2 or 2+1 trucks. There were wood frame trucks like the standard B&O 'log-frame' (Abdill pg. 60 & 70), USMRR style (Abdill pg. 64) and inside bearing trucks (Abdill pg. 102). Last edited by Train Detainer on Wed Apr 13, 2016 2:21 pm, edited 1 time in total. I am now looking to see if any of the 'later' editions of this have coverage of a later stage of evolution in tender trucks. I believe this illustration was posted earlier, but some of those sites are no longer available. Oh, how addictive the Internet is, and it's not just YouTube. . .
Hah, couldn't agree more. The passionate would likely get lost in the internet. Thanks for the link, very informative. Now you got me started. Well, I recently acquired a copy of Gerald Best's "Iron Horses to Promontory," and in it, on page 66, is a photograph of Central Pacific's No. 28, the Gold Run. 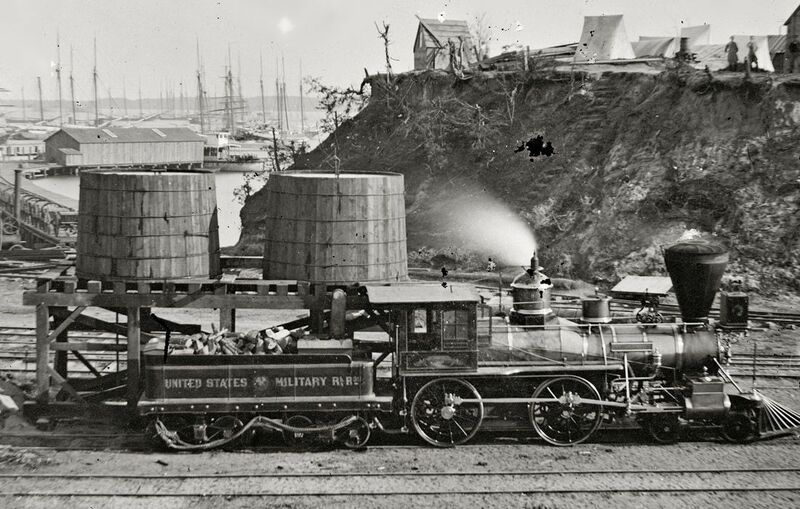 It was built in February of 1867 by McKay & Aldus (same builder as the Lehigh Valley engine that started all this), along with sister 29, the Antelope--and it too has what I would call those "swoopy" tender trucks. I find it interesting that these trucks show up under the tenders of locomotives from at least two different builders. This suggests they may have been something from a truck builder. Now, who might that have been? Then again, these products of McKay & Aldus look an awful lot like something from Mason. . .
Did Mason have a name change at some point in its history? Last edited by J3a-614 on Mon May 30, 2016 11:16 am, edited 1 time in total. Interesting info that the Antelope was supposed to be at Promontory for the Gold Spike ceremony, but due to some incurred damage, the Jupiter represented the Central Pacific instead. Always great to learn something new! Resurrecting this thread re: the OP question. Has anyone else found anything on these curved frame trucks? I have searched the patent records, as many old periodicals as I can and not found anything more than a few more pics, some more helpful than others. As near as I can tell, these trucks were only built from about 1866 to 1869. I have not found anything to indicate otherwise, and it seems like they disappeared altogether rather quickly, probably for the reasons stated below. I decided to scale the pics I could find and take a stab at reverse engineering them, taking into account the casting/machining abilities and other designs of the time. The drawings are not complete - there are some details like the shape of the inner spring landings and rocker link boxes that I didn't take time to finish - just conceptual at this point. It appears they were meant to be a very minimal/simple design, but still there's a bit to them. The problem seems to be they look nice, but the design is quite flawed. If I'm reasonably correct, the flaws include; way too rigid, not capable of carrying heavier loads (without making them even more rigid and way too heavy and consequently not as aesthetically attractive), a maintenance headache, non-standard compliant (which wasn't much of a concern when they were designed), and probably too fragile as they approached their load limit. They appear to use a four-point suspension with rocker links above the springs. There are several other designs from around that time that share certain design characteristics like the rocker links and center pin, including from Hinkley and Baldwin as shown in the 1871 Weissenborn book. Side frames appear to be a riveted sandwich of three castings, also riveted to the one-piece bolster. The only add-on pieces would be the spring bundles, rocker group and binder/cover/name plate, and the journals/cellars/wheelsets. My version of journal is probably more guess than reality - they were probably more of an earlier Winans style like on page 301 of White's American Locomotives. Brake rigging was frame-hung, so not shown. In any case, here are a few scale sketches based on the available photos. If anyone knows what happened to Wallace's Mason collection, there's a side-on photo of Highland Light c/n273 would be helpful if a hi-res scan were available. Nice to see this thread come back to life, and with what may be some good speculation on the truck design, too! I tried to look for another illustration of the Highland Light, specifically the photo mentioned. That didn't turn up, but some other illustrations, which included the "Central Pacific" style of tender truck did. 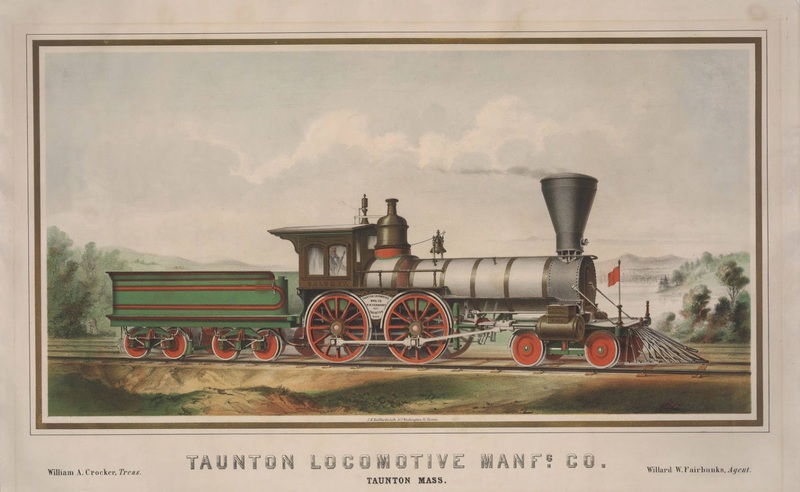 Of particular interest to me is this Taunton locomotive, which appears to be a stock engine, but lacking sanders, sand dome, and any provision for a headlight. It was common for engines in this time period to not be delivered with a light--these were often provided by the railroads, or as some have suggested, by the engineers themselves in the days of assigned engines--but this one even lacks the bracket you would normally see. Could this have been an export job? Those CP trucks again, and on an McKay & Aldus engine. . .the same firm that built the Antelope. This suggests those swoopy trucks may have been from a truck builder rather than the product of a locomotive shop. Another find, with what appears to be an arch bar variation, and simply included as a Civil War era photo that I haven't seen before. Last edited by J3a-614 on Sat May 19, 2018 11:03 am, edited 2 times in total. Thanks for making and posting the above drawings of the mystery tender truck that opened this thread. So that would preclude the idea that the customer for the Highland Light designed the curved sideframe tender trucks; and strongly suggests that the trucks were Mason’s own invention. That seems probable, since Mason was known for his creative innovation and desire to try new ideas. The photos I have seen of this type of truck show only the side frames and journal boxes with any clarity. Do you have other photos that show some of the internal details that you show in your drawings?